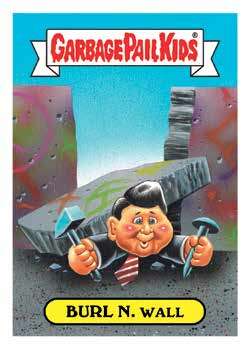 Although many remember the decade fondly, 2018 Topps Garbage Pail Kids Series 1 We Hate the '80s pulls no punches. 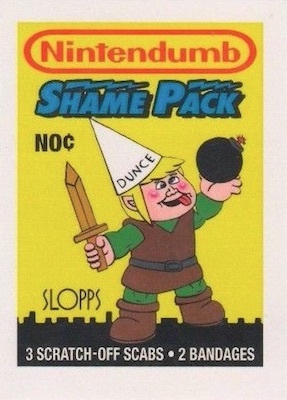 The sticker set provides a new assortment of GPK humor and artwork set around the era that has not seemed to age all that well. Broken down into several different options, Hobby Collector boxes are the only format to guarantee a hit in 2018 Topps Garbage Pail Kids Series 1. With 180 total cards, the 2018 GPK We Hate the '80s base set features 90 new images with two different names (A and B versions) for each. Themed subsets cover a wide array of topics, including cartoons, fashion, films, television and video games. 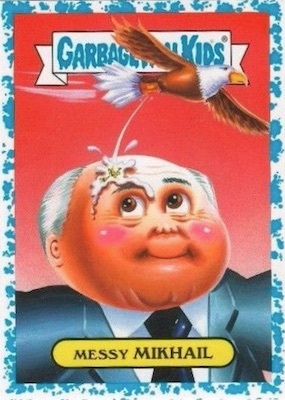 There are also the typical, gross-out GPK parallels. Puke versions fall one per pack in Retail and Hobby boxes, and Bruised editions come in each pack of the Hobby Collector boxes. In addition, Spit (#/99) and Bloody Nose (#/75) are both Hobby Collector exclusives, while Fool's Gold (#/50) is not limited to one format. Also confined to Hobby Collector boxes, the '80s Wax Pack Parodies insert offers another playful take on the period, but from the perspective of the wrapping for a pack of cards. 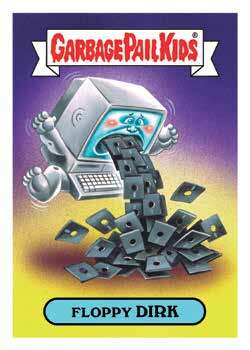 Despite being more about entertainment value, 2018 Topps Garbage Pail Kids Series 1 does have a few standard hits. There are base Artist Autographs and Printing Plates, as well several sketch inserts. Normal Sketch cards come in Hobby display boxes, and Shaped Sketch and Double Artist Panoramic Sketch cards reside in the Hobby Collector boxes. Manufactured Patch cards are also only found in Hobby Collector boxes. 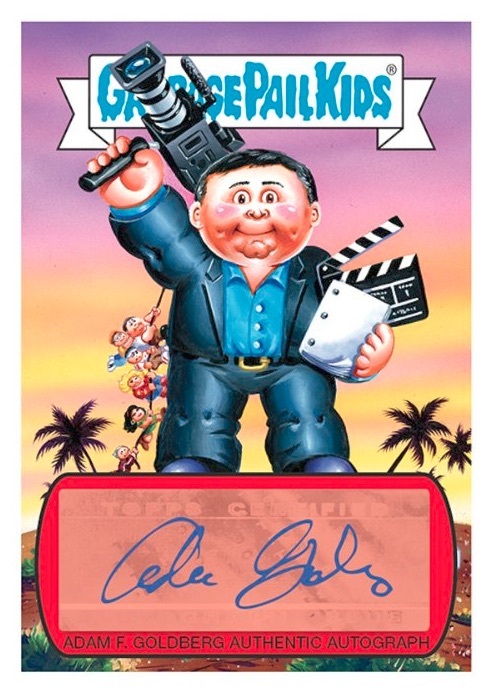 Further delving into the decade, The Goldbergs, a popular ABC sitcom set in the 1980s, is showcased in 2018 Topps Garbage Pail Kids Series 1, with GPK options for key cast members and the creator, Adam F. Goldberg. Other choices include Murray Goldberg (played by Jeff Garlin), Albert "Pops" Solomon (George Segal), and Patton Oswalt as the voice of adult Adam F. Goldberg. This includes regular sticker cards and signed versions, as well. 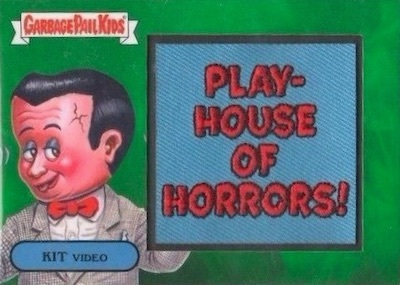 2018 GPK OTH FULL COLOR GLOW IN THE DARK RETURN SKETCH CARD! 180 cards, including 90 A and B names. Shop complete sets on eBay. PARALLEL CARDS: Puke (1 per Retail/Hobby pack), Bruised (1 per Collector pack), Spit #/99 (Collector), Bloody Nose #/75 (Collector), Fool’s Gold #/50, Printing Plates 1/1. 20 cards. Hobby Collector only. 10 cards. Hobby Collector only. 20 cards. Fat Pack only. 8 cards. Value Box only. Here are the top deals on collector boxes currently listed on eBay. 2018 Garbage Pail Kids Series #2 Oh, the Horror-ible COLLECTOR BOX NEW SEALED! !